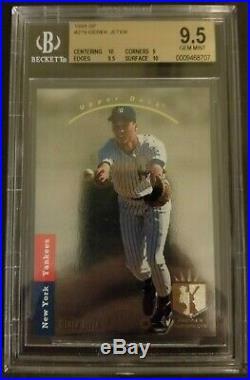 SIMPLY ASTONISHING JETER ROOKIE SP FOIL. BEST LOOKING VISUAL JETER CARD THAT ANYONE WILL PROBABLY EVER SEE!!! 10 SURFACE (WHICH IS UNHEARD OF IN A 1993 SP FOIL), PLUS 10 CENTERING!! THE SURFACE IS SO ASTOUNDING. IT'S UNBELIEVABLE, SO BRIGHT, SO CLEAR AND SO UNBLEMISHED!!! IT IS SO VISUALLY STUNNING!! I THINK THAT I HAVE CAPTURED THAT IN MY PICTURE, BUT IT IS HARD TO SHOW PROPERLY IN A PICTURE. THERE ARE ONLY 2 YES, TWO!!! BGS 9.5 SP FOIL JETER CARDS THAT HAVE EVER EVEN BEEN GRADED WITH A 10 SURFACE!!! AND THIS IS THE ONLY ONE THAT HAS 2 10 SUB-GRADES. I CAN'T EXPLAIN HOW GORGEOUS THIS CARD IS. THE SURFACE IS BLEMISH FREE AND IT IS THE BEST LOOKING JETER THAT YOU WILL PROBABLY VIEW IN YOUR LIFETIME. 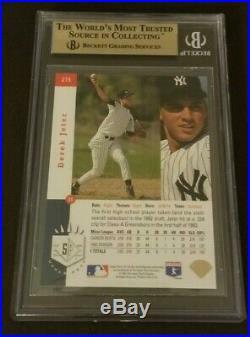 IF YOU EVER WANT TO SEE WHAT A 1993 DEREK JETER SP FOIL SHOULD LOOK LIKE, THIS IS EXACTLY THE BLUEPRINT OF WHAT YOU WANT TO FOLLOW. 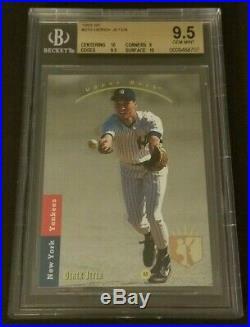 ONE OF THE TOP 7 SP FOIL JETER ROOKIE CARDS EVER GRADED BY BGS!!! YES, YOU READ THAT CORRECTLY!! SIMPLY ASTONISHING CARD THAT NEVER COMES AVAILABLE FOR SALE. PLEASE READ ALL THE DETAILS BELOW!! THIS BGS 9.5 INCLUDES 2 SUBGRADES OF 10, WHICH IS 3 TIMES MORE RARE THAN ANY PSA 10!!! YES, THREE TIMES MORE RARE THAN A PSA 10!! FACT #1 - THERE ARE. ONLY 7 BGS 9.5 SP FOIL JETER ROOKIE CARDS THAT HAVE EVER BEEN GRADED WITH 2 10 SUBGRADES AND. THIS IS ONE OF THEM. (DETAILS OF EACH OF THESE 7 CARDS ARE LISTED BELOW, INCLUDING SUBGRADES AND SERIAL NUMBERS). YOU DID READ THAT CORRECTLY, ONLY SEVEN OF THE 14,000 PLUS JETER CARDS GRADED BY BGS HAVE EVER RECEIVED A BGS 9.5 GRADE WITH TWO SEPARATE SUBGRADES OF 10!!! THIS INCLUDES GRADING FOR OVER 25 YEARS SINCE THE PRODUCTION OF THIS CARD!! BECKETT BGS 9.5 W/2 10 SUBGRADES = 7 OUT OF 14,436 GRADED = 0.000485. THERE ARE ABSOLUTELY NO BGS 10 SP FOIL JETER CARDS IN EXISTENCE. THIS IS ONE OF THE TOP 7 CARDS EVER GRADED BY BGS!! FACT #2 - THE BECKETT BGS 9.5 W/2 10 SUBGRADES IS STILL 3 TIMES MORE RARE THAN A PSA 10. PSA 10 = 22 OUT OF 14,295 GRADED. BGS 9.5 w/2 10 SUBGRADES = 7 OUT OF 14,1436 GRADED. YES, 3 TIMES MORE RARE THAN A PSA 10!! FACT #3 - THIS PARTICULAR CARD IS THE ONLY BGS 9.5 THAT INCLUDES GRADES FOR 10 CENTERING AND 10 SURFACE, THE 2 MOST IMPORTANT SUBGRADES VISUALLY!! SIMPLY SPECTACULAR AND YOU ARE NOT GOING TO SEE ANOTHER ONE OF THESE IN THE MARKETPLACE!!!! See the data below from Beckett Grading, which can be detailed at the following link. Don't need to list the accomplishments for Jeter. He should be a first ballot Hall of Famer without any doubt and is simply a pure Yankee!! The card speaks for itself and is a once in a lifetime opportunity for a true baseball card investment opportunity. THANK YOU ALL FOR TAKING THE TIME TO CONSIDER THIS ITEM. 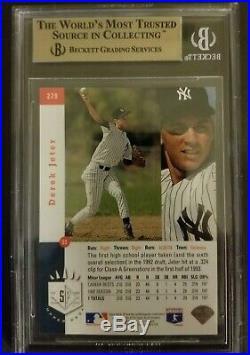 The item "1993 DEREK JETER SP FOIL BGS 9.5 with2 10 SUBGRADES BEST BGS 9.5 ON EBAY VIEWithREAD" is in sale since Thursday, March 7, 2019. This item is in the category "Sports Mem, Cards & Fan Shop\Sports Trading Cards\Baseball Cards". The seller is "miltonenterprises" and is located in Frisco, Texas. This item can be shipped to United States.